With no middle-man, we are able to offer you better teardrop camper prices. 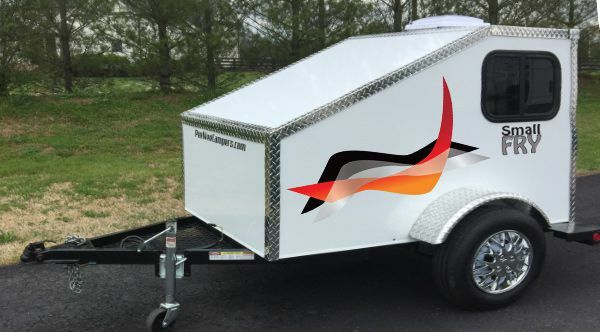 It only takes 10% down to get your teardrop trailer into production. Learn all about our warranty here. 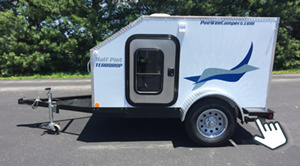 Travel to Nashville to see a teardrop camper and receive a 4.5% discount (up to $400) toward your purchase. Waive the 400 mile free delivery for even more credit toward your total price. Apply by phone or online. Get approval status within 24 hours. Box: 5' x 8' x 4'3"
This model comes with a galley and so many amenities that it's ready to camp the day you get it. These features are included in the base price: mattresses, cabinets inside and in galley, 2 side doors, and more. The ECONO is the same build as the Half Pint, but it has fewer amenities included in the base price. This “lean” model has no mattresses, cabinets, galley, or second side door, but these are available as options. 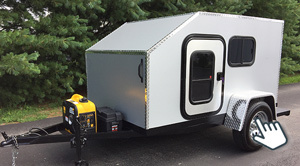 A different wall system, fewer amenities and options available make this entry level camper perfect for hunters, fishermen, and outdoor enthusiasts. D-I-Y-ers can outfit this camper easily. Box: 4' x 6' x 44"
The Small-Fry is our smallest and lightest camper. It's size - 4' x 6' - makes it perfect for one person. It's small size and light weight means it can be towed easily by a trike or motorcycle or car. Box Interior: 5' x 10' x 6'-4"
Compare our newest model on the left, the "Big Brother" to it's little brother on the right, the "Half Pint." Big Brother is our tallest and longest trailer. You can stand up in this one. Features include 12-V battery, 120-V power, AC, 2 beds, kitchen, sink, refrigerator/freezer, porta-potty, and more.